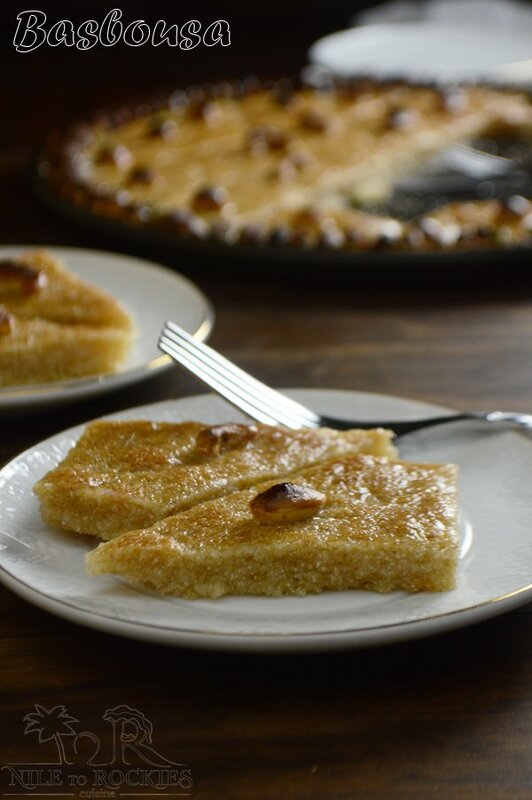 Basbousa is a grainy semolina cake, soaked in simple syrup and topped with crunchy nuts, one of the Middle East sweet goodies. Basbousa, has a special place in every Middle Eastern heart and soul. It is packed full with good memories, specially memories of the holy month of Ramadan, where family and friends gather to break their long fasting day. 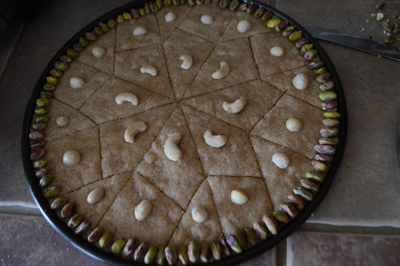 Memories of friends visiting and coming over, any time of the year holding a tray of basbousa as a gift. Memories of banquets and feasts and probably new babies arriving to this world. All are happy and soul nourishing memories.Skip to recipe. As I’ve said before, in my other post about basbousa, the secret has not yet been revealed, no matter how we try, it is still not the same as the one we buy from stores in Egypt. I have a long history or trial and error with basbousa that goes back may be more than 10 years ago. 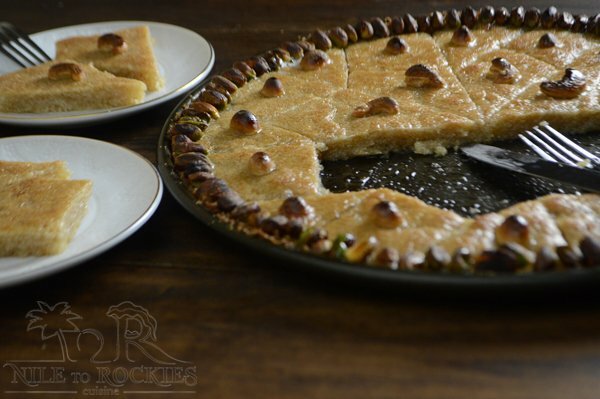 I was a working mama and I had no time to even cook dinner back then, but there was something special about the basbousa that made me come back and try new recipe every now and then. I really wanted to perfect this recipe, and I still am!!! 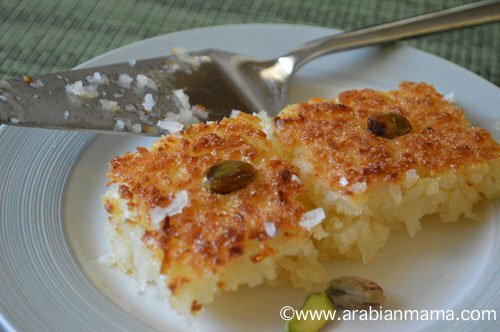 One day I’ve made this recipe and I was really so proud, and when my brother in law tasted it he told me, this basbousa tastes great but it is more like a rice pudding rather than basbousa . Another time, I had the woman who helps me cleaning and do house work for me, she took a bite and told me Amira can you please give up!!!. They were all against me and I was sure it is a conspiracy, and nobody believed that I can make at least a decent version, and you know what? they were right, I was really horrible in the kitchen, no one liked my basbousa except my poor little 2 years old, who was crazy about basbousa- and still is after almost 11 years. Making basbousa like stores is a dream, but this version, let me tell you is unbelievably close to it. I took it to an Egyptian gathering and I had rave reviews about it and everyone was asking about the recipe. So what’s the difference between this recipe and my first recipe of basbousa, I used milk instead of yogurt for this recipe. The feedback from friends was so great, that I’ve made it three times in only one week. It is less homey, that was hubby’s opinion but it is more towards the store bought ones. 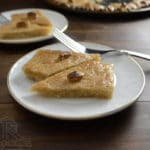 So if you are a fan of basbousa, try this recipe for a change and let me know what do you think? If you do not know what is basbousa and never tried it before then I ask you please, to try both recipes and tell me which one do you like more. 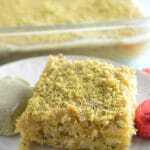 If you have semolina, this is a great recipe to use it as a week night treat for your family. Thank you and have a great week. 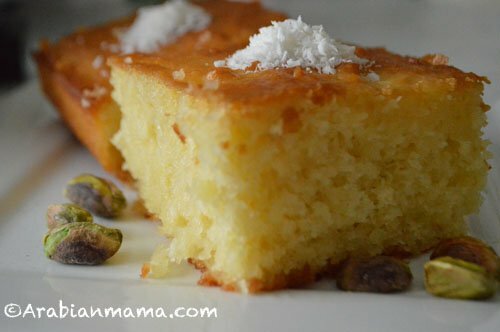 A new recipe for the Middle Eastern semolina cake, basbousa. *2 Tablespoon fine unsweetened coconut flakes. 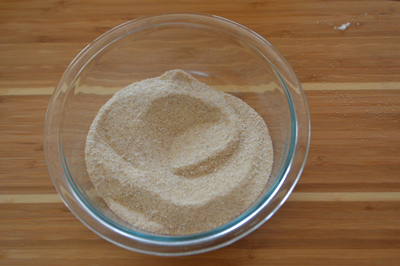 2 cup of granulated sugar. A dash of vanilla powder or a teaspoon of orange blossom water. In a bowl, combine the first 4 ingredients and mix well. 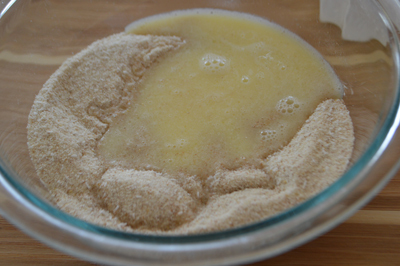 Warm the butter and milk, until butter is melted and add to the above mixture. Mix all the ingredients until well incorporated and all the grains are wet. 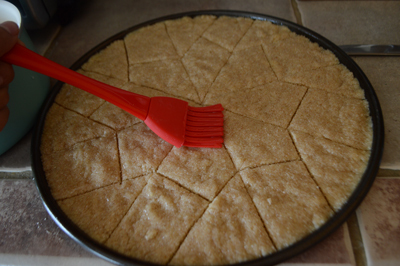 Butter a 13x9 cookie sheet or a 16" pizza pan, and spread the batter evenly. Brush the surface with some simple syrup. Sprinkle nuts on top or arrange in a decorative way. Bake in a 350F preheated oven, bake for 15 minutes, then broil for another 5 minutes until golden brown, be careful and keep an eye on it. Meanwhile, prepare the simple syrup by adding sugar and water together, Boil for 10 minutes using medium heat, turn of the heat then add the vanilla or the orange blossom water. Soak in hot simple syrup, and let it cool. These types of cakes are so good. And any sweet dipped in a simple syrup…yum. I had no idea basbousa could such a challenge! I would happily devour yours here. It is probably the most puzzling recipe in the Middle Eastern cuisine :). Thanks Eve, I hope you’ll give it a go. Assalaamu Alaykum Amira, very tasty looking basbousa – moist and holds together well. It’s been years since I made basbousa I’ve forgot what its ‘true’ texture is like, but a recent yogurt cake I made reminded my husband of basbousa. I’ve never had basbousa from a store, always homemade. 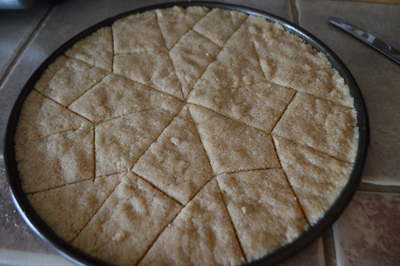 I do make a similar Algerian semolina dessert called qalb El louz every Ramadan and I always worry about how it will turn out because of my many failed attempts previously, so I understand your recipe struggles. 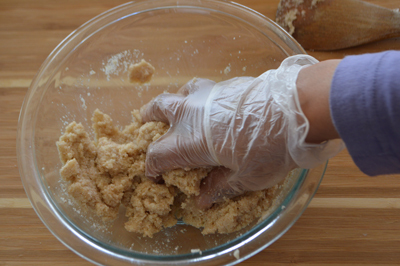 Plus it’s good for us to improve on our homemade recipes once in a while, it gives us a sense of achievement. Baarak Allahu feeki. 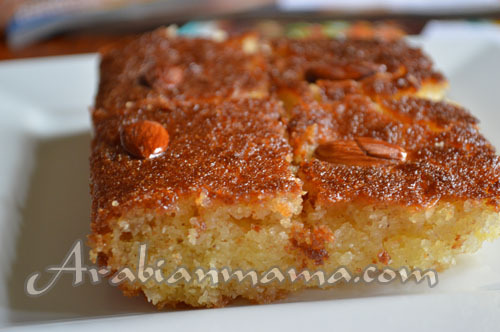 I may try your basbousa recipe this Ramadan in shaa Allah for a change to my usual semolina-based desserts. I’ve heard so much of qalb el looz and I would love to try it one day. I’ll search your spcae anf I hope you have a good recipe for it. Happy Ramadan ISA, may Allah accept our good deeds. I admire your persistence! A good trait, IMO. And it pays off when you get a recipe the way you want it, doesn’t it? This sound fabulous — thanks. Thanks John, sometimes it really gets to my nerves and I feel persistence :), and this time after more than 10 years it really did worth it . 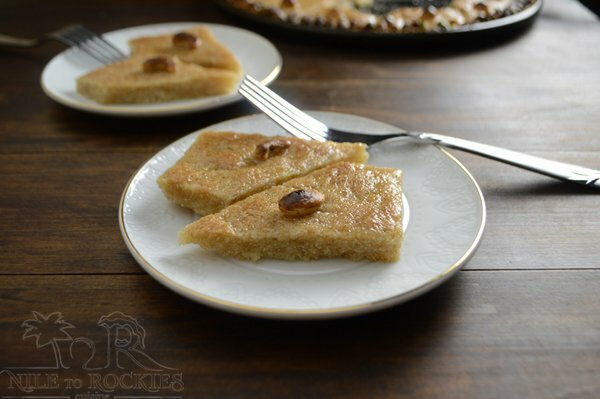 I just semolina cake once, but never made myself…it sure looks delicious and so easy to make. 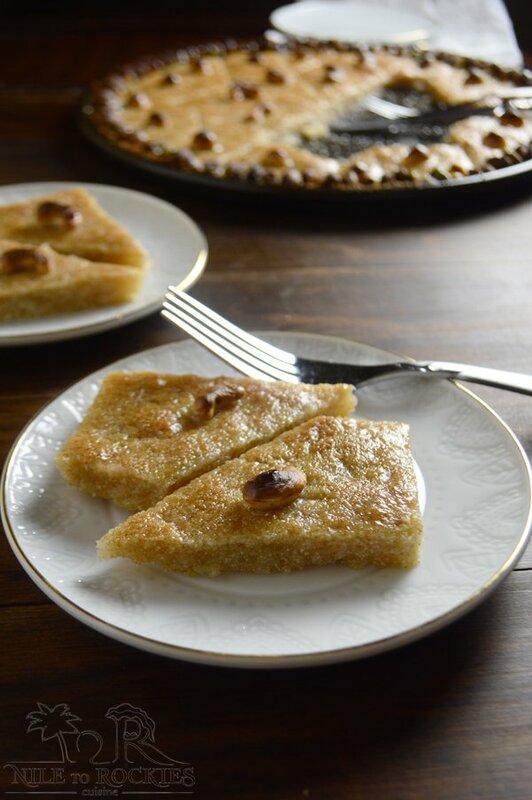 Semolina is a stable in the Arabic cuisine, and basbousa is oh so deivine. I hope you” give it a try Juliana. Thanks for visiting.